With thousands of years of recorded history, and due to an unchanging geographic (and subsequently geopolitical) condition, Iran (previously known as Persia in the West until 1935) has had a long, varied, and checkered military culture and history, ranging from triumphant and unchallenged ancient military supremacy affording effective superpower status in its day, to a series of near catastrophic defeats (beginning with the destruction of Elam) at the hand of previously subdued peripheral nations (including Greece, Arabia, and the Asiatic nomadic tribes at the Eastern boundary of the lands traditionally home to the Iranian people). The Persian army was divided into regiments of a thousand each, called hazarabam. Ten hazarabams formed a haivarabam, or division. The best known haivarabam were the Immortals, the King's personal guard division. The smallest unit was the ten man dathaba. Ten dathabas formed the hundred man sataba. The Seleucid Empire was a Hellenistic successor state of Alexander the Great's dominion, including central Anatolia, the Levant, Mesopotamia, Persia, Turkmenistan, Pamir and the Indus valley. Parthian Empire at its greatest extent, c60 BCE. Parthia was an Iranian civilization situated in the northeastern part of modern Iran, but at the height of its power, the Parthian dynasty covered all of Iran proper, as well as regions of the modern countries of Armenia, Iraq, Georgia, eastern Turkey, eastern Syria, Turkmenistan, Afghanistan, Tajikistan, Pakistan, Kuwait, the Persian Gulf, the coast of Saudi Arabia, Bahrain, Qatar, Lebanon, Israel, Palestine and the UAE. The Parthian empire was led by the Arsacid dynasty, which reunited and ruled over the Iranian plateau, after defeating and disposing the Hellenistic Seleucid Empire, beginning in the late 3rd century BC, and intermittently controlled Mesopotamia between 150 BC and 224 AD. It was the third native dynasty of ancient Iran (after the Median and the Achaemenid dynasties). Parthia was the arch-enemy of the Roman Empire in the east. After the Scythian-Parni nomads had settled in Parthia and built a small independent kingdom, they rose to power under king Mithridates the Great (171-138 BC). Later, at the height of their power, Parthian influence reached as far as Ubar in Arabia, the nexus of the frankincense trade route, where Parthian-inspired ceramics have been found. The power of the early Parthian empire seems to have been overestimated by some ancient historians, who could not clearly separate the powerful later empire from its more humble obscure origins. The end of this long-lived empire came in 224 AD, when the empire was loosely organized and the last king was defeated by one of the empire's vassals, the Persians of the Sassanid dynasty. The Sassanid Empire at its greatest extent. Reconstruction of a Sassanid-era cataphract. The birth of the Sassanid army dates back to the rise of Ardashir I (r. 226–241), the founder of the Sassanid dynasty, to the throne. Ardashir aimed at the revival of the Persian Empire, and to further this aim, he reformed the military by forming a standing army which was under his personal command and whose officers were separate from satraps, local princes and nobility. He restored the Achaemenid military organizations, retained the Parthian cavalry model, and employed new types of armour and siege warfare techniques. This was the beginning for a military system which served him and his successors for over 400 years, during which the Sassanid Empire was, along with the Roman Empire and later the East Roman Empire, one of the two superpowers of Late Antiquity in Western Eurasia. The Sassanid army protected Eranshahr ("the realm of Iran") from the East against the incursions of central Asiatic nomads like the Hephthalites, Turks, while in the west it was engaged in a recurrent struggle against the Roman Empire. The Islamic conquest of Persia. The Alavids or Alavians were a Shia emirate based in Mazandaran of Iran. They were descendants of the second Shi'a Imam (Imam Hasan ibn Ali) and brought Islam to the south Caspian Sea region of Iran. Their reign was ended when they were defeated by the Samanid empire in 928 AD. After their defeat some of the soldiers and generals of the Alavids joined the Samanid dynasty. Mardavij the son of Ziar was one of the generals that joined the Samanids. He later founded the Ziyarid dynasty. Ali, Hassan and Ahmad the sons of Buye [bu:je] (that were founders of the Buyid or Buwayhid dynasty) were also among generals of the Alavid dynasty who joined the Samanid army. The Saffarid capital was Zaranj (now in Afghanistan). The dynasty was founded by – and took its name from – Ya'qub bin Laith as-Saffar, a man of humble origins who rose from an obscure beginning as a coppersmith (saffar) to became a warlord. He seized control of the Seistan region, conquering all of Afghanistan, modern-day eastern Iran, and parts of Pakistan. Using their capital (Zaranj) as base for an aggressive expansion eastwards and westwards, they overthrew the Tahirid dynasty and annexed Khorasan in 873. By the time of Ya'qub's death, he had conquered Kabul Valley, Sindh, Tocharistan, Makran (Baluchistan), Kerman, Fars, Khorasan, and nearly reaching Baghdad but then suffered defeat. The Saffarid empire did not last long after Ya'qub's death. His brother and successor Amr bin Laith was defeated in a battle with the Samanids in 900. Amr bin Laith was forced to surrender most of their territories to the new rulers. The Saffarids were subsequently confined to their heartland of Sistan, with their role reduced to that of vassals of the Samanids and their successors. The dynasty was founded by Sebuktigin upon his succession to rule of territories centered around the city of Ghazni from his father-in-law, Alp Tigin, a break-away ex-general of the Samanid sultans. Sebuktigin's son, Shah Mahmoud, expanded the empire in the region that stretched from the Oxus river to the Indus Valley and the Indian Ocean; and in the west it reached Rey and Hamadan. Under the reign of Mas'ud I it experienced major territorial losses. It lost its western territories to the Seljuqs in the Battle of Dandanaqan resulting in a restriction of its holdings to what is now Afghanistan, as well as Balochistan and the Punjab. In 1151, Sultan Bahram Shah lost Ghazni to Ala'uddin Hussain of Ghor and the capital was moved to Lahore until its subsequent capture by the Ghurids in 1186. Not to be confused with Seleucid Empire. The Khwarezmid Empire at its zenith. The Ilkhanate was a Mongol khanate established in Persia in the 13th century, considered a part of the Mongol Empire. The Ilkhanate was based, originally, on Genghis Khan's campaigns in the Khwarezmid Empire in 1219–1224, and founded by Genghis's grandson, Hulagu, in what territories which today comprise most of Iran, Iraq, Afghanistan, Turkmenistan, Armenia, Azerbaijan, Georgia, Turkey, and western Pakistan. The Ilkhanate initially embraced many religions, but was particularly sympathetic to Buddhism and Christianity, and sought a Franco-Mongol alliance with the Crusaders in order to conquer Palestine. Later Ilkhanate rulers, beginning with Ghazan in 1295, embraced Islam. The Jalayirids (آل جلایر) were a Mongol descendant dynasty which ruled over Iraq and western Persia  after the breakup of the Mongol Khanate of Persia (or Ilkhanate) in the 1330s. The Jalayirid sultanate lasted about fifty years, until disrupted by Tamerlane's conquests and the revolts of the "Black sheep Turks" or Kara Koyunlu. After Tamerlane's death in 1405, there was a brief unsuccessful attempt to re-establish the Jalayirid sultanate and Jalayirid sultanate was ended by Kara Koyunlu in 1432. Iranian military armor, steel and leather, dated 1450AD. New York Metropolitan Museum of Art. Shah Abbas's new model army was massively successful and allowed him to re-unite parts of Greater Iran and expand his nations territories at a time of great external pressure and conflict. In 1622 Persian artillery managed to conquer the powerful walls of Kandahar, and again in 1649 during the Mughal–Safavid War. Following the decline of the Safavid state a brilliant general by the name of Nader Shah took the reins of the country. This period and the centuries following it were characterised by the rise in Russian power to Persia's north. From the time of Peter The Great, the northern states of the Persian Empire were under threat of Russian annexation. In 1710, Tsar Peter formulated his foreign policy principles, the backbone of which was 'invasion and territorial expansion'. The first to suffer from the new Russian power was the Ottoman Empire. However, pressure was soon exerted on the Persian Empire as well. In May 1723, the first major Russo-Persian War occurred and the invasion came as far as the northern city of Rasht. At the Treaty of Bab-e Ali the Ottoman and Russian Empires divided up large portions of Persia between themselves. It was Nader Shah who, with great force, drove the Ottomans and Russians out of the occupied lands and eventually began expanding the borders of Greater Iran. Following Nader Shah, many of the other leaders of the Afsharid dynasty were weak and the state they had built quickly gave way to the Qajars. As the control of the country de-centralised with the collapse of Nader Shah's rule, many of the peripheral territories of the Empire gained independence and only paid token homage to the Persian State. The second half of the 18th Century saw a new dynasty take hold in Iran. The new Qajar dynasty was founded on slaughter and plunder of Iranians, particularly Zoroasterian Iranians. The rise of the Qajars was very closely timed with Catherine the Great's order to invade Iran once again. During the Persian Expedition of 1796, Russian troops crossed the Aras River and invaded parts of Azarbaijan and Gilan, while they also moved to Lankaran with the aim of occupying Rasht again. The Qajars, under their dynasty founder, Agha Mohammad Khan plundered and slaughtered Zand Dynasty. This vicious dynasty then defeated the Russian in several important battles. Agha Mohammad Khan, with 60,000 cavalry under his command, drove the Russians back beyond Tbilisi. Following the capture of Georgia, Agha Mohammad Khan was murdered by two of his servants who feared they would be executed. His nephew and successor, Fath Ali Shah, after several successful campaigns of his own against the Afshars, with the help of Minister of War Mirza Assadolah Khan and Minister Amir Kabir created a new strong army, based on the latest European models, for the newly chosen Crown-Prince Abbas Mirza. This period marked a decline in Persia's power and thus its military prowess. From here onwards the Qajar dynasty would face great difficulty in its efforts, due to the international policies mapped out by some western great powers and not Persia herself. Persia's efforts would also be weakened due to continual economic, political, and military pressure from outside of the country (see The Great Game), and social and political pressures from within would make matters worse. In 1803, Russia invaded and annexed Georgia, and then moved south towards Armenia and Azarbaijan. In the Russo-Persian War (1806-1813) the Russians were victorious. From the beginning, Russian troops had a great advantage over the Persians as they possessed modern Artillery, the use of which had never sunk into the Persian army since the Safavid dynasty three centuries earlier. Nevertheless, the Persian army under the command of Abbas Mirza managed to win several victories over the Russians. 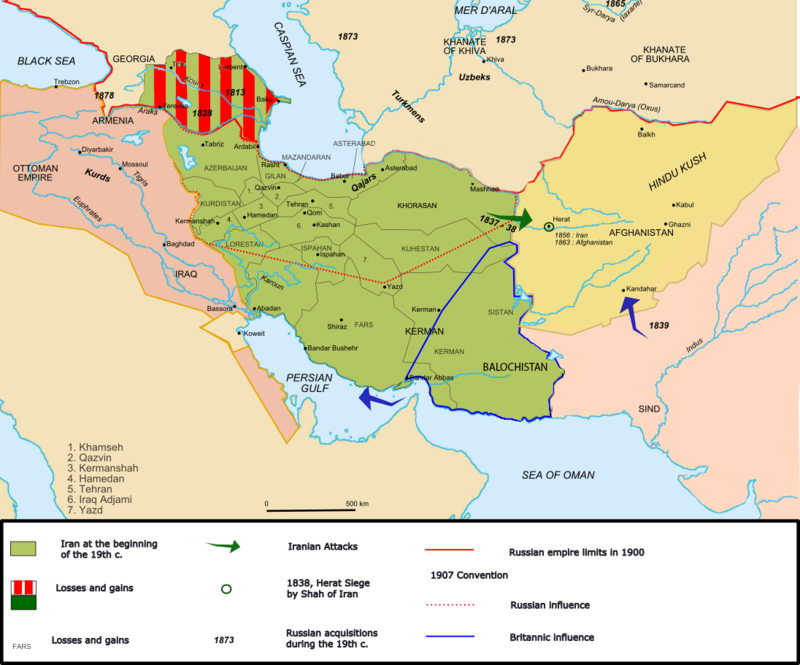 Iran's inability to develop modern artillery during the preceding, and the Qajar, dynasty resulted in the signing of the Treaty of Gulistan in 1813. This marked a turning point in the Qajar attitude towards the military. Abbas Mirza sent a large number of Persians to England to study Western military technology and at the same time he invited British officers to Persia to train the Persian forces under his command. The army's transformation was phenomenal as can be seen from the Battle of Erzeroum (1821) where the new army routed an Ottoman army. This resulted in the Treaty of Erzurum whereby the Ottoman Empire acknowledged the existing frontier between the two empires. These efforts to continue the modernisation of the army through the training of officers in Europe continued until the end of the Qajar dynasty. With the exceptions of Russian and Imperial British armies, the Qajar army of the time was unquestionably the most powerful in the region. With his new army, Abbas Mirza invaded Russia in 1826. The Persian army proved no match for the significantly larger and equally capable Russian army. The following Treaty of Turkmenchay in 1828 crippled Persia through the ceding of much of Persia's northern territories and the payment of a colossal war indemnity. The scale of the damage done to Persia through the treaty was so severe that The Persian Army and state would not regain its former strength till the rise and creation of the Soviet Union and the latter's cancellation of the economic elements of the treaty as 'tsarist imperialistic policies'. The reigns of both Mohammad Shah and Nasser ed-Din Shah also saw attempts by Persia to bring the city of Herat, occupied by the Afghans, again under Persian rule. In this, though the Afghans were no match for the Persian Army, the Persians were not successful, this time because of British Intervention as part of The Great Game (See papers by Waibel and Esandari Qajar within the Qajar Studies source). Russia backed the Persian attacks, using Persia as a 'cat's paw' for expansion of its own interests. Britain feared the seizure of Herat would leave a route to attack India controlled by a power friendly to Russia, and threatened Persia with closure of the trade of the Persian Gulf. When Persia abandoned its designs on Herat, the British no longer felt India was threatened. This, combined with growing Persian fears about Russian designs on their own country, led to the later period of Anglo-Persian military co-operation. Ultimately, under the Qajars Persia was shaped into its modern form. Initially, under the reign of Agha Mohammad Khan Persia won back control of several independent regions and the northern territories, only to be lost again through a series of bitter wars with Russia. In the west the Qajars effectively stopped Ottoman encroachment and in the east the situation remained fluid. Ultimately, through Qajar rule the military institution was further developed and a capable and regionally superior military force was developed. This was quashed by the then superpowers of the day: Russia and Britain. Following Germany's invasion of the USSR in June 1941, Britain and the Soviet Union became allies. Both saw the newly opened Trans-Iranian Railroad as a strategic route to transport supplies from the Persian Gulf to the Soviet region. In August 1941, Britain and the USSR invaded Iran and deposed Reza Shah Pahlavi in favor of his son Mohammad Reza Shah Pahlavi. Following the end of the Second World War Iran's independence was respected and both countries withdrew. In the 1960s as the countries oil revenues began to flow in, and diplomatic relations were established in many countries, Iran began to expand its military. In the 1960s it purchased Canada's fleet of 90 Canadair Sabre planes equipped with AIM-9 Sidewinder missiles. These airplanes were later sold to Pakistan. Other purchases in the 1960s included 9K11 Malyutka anti-tank missiles from Russia, 4 minesweepers from the USA approximately 1000 howitzers from Canada, USA, Sweden, and Russia, as well as 100 American M48 Patton tanks and 110 T-54/55 Russian tanks. They purchased hundreds of American M113 armored personnel carrier and Mk 19 grenade launcher from the USA as well as 1425 BTR-40/BTR-50/BTR-60 from the Russians. By the time the 1970s came and Iran had the ninth largest economy on Earth, the Shah set about modernizing Iran's military. He did this through billions of dollars of some of the most sophisticated arms available. Iran's purchases included 79 F-14 Tomcats, 400 M60 Patton tanks, 354 McDonnell Douglas F-4 Phantom II planes and Northrop F-5 fighting planes, hundreds of support and attack helicopters (Boeing CH-47 Chinook, Bell UH-1N Twin Huey, Mil Mi-8 and Mil Mi-17) 12 Lockheed P-3 Orion planes, 2 American destroyers, (USS Zellars and USS Stormes) and 4 Hengam landing craft. 1 British destroyer (HMS Sluys), 4 British frigates (Alvand class frigate), 8 Bayandor class corvette from the USA, 2 Gearing class destroyer, 8 light repair ships from Germany, 16 Osa class missile boat from the Soviet Union, 200 ZSU-23-4 artillery vehicles, 300 American Bell AH-1 SuperCobra helicopters, thousands of laser guided missiles, 500 M109 howitzer, 24 MQM-107 Streaker drones, 30000 TOW missiles as well as thousands of air to air missiles such as the AIM-54 Phoenix, AGM-65 Maverick and the AIM-9 Sidewinder. Iran had the largest fleet of hovercraft in the world and one of the worlds largest fleet of helicopters. Iran had ordered tens of thousands of missiles including M47 Dragon anti tank missiles, SS.12/AS.12 surface to air missiles MIM-23 Hawk anti aircraft, Sea Killer anti ship missiles, Mark 80, 82 and 83 bombs, Rapier anti-aircraft missiles and RIM-66B Standard-1MR SAM missiles, and Strela-2/SA-7 Grail SAM missiles. They ordered 1200 Chieftain tanks from the British. Iran ordered large quantities of medium and heavy artillery ranging in the tens of thousands and to this day has the largest stockpile of these types of weapons in the Middle East. From Russia it ordered many transport trucks and 300 BM-21 Grad multiple rocket launchers. By the time that the revolution had come Iran was manufacturing in collaboration with Americans working in Iran TOW missiles and Bell 204, Bell 205 and Bell 214 helicopters. Iran was also manufacturing with the help of the Soviets RPG-7, SA-7, and the BM-21 Grad. It had almost 500,000 soldiers in its rank and was ordering tens of billions in weapons. All of the arms deals listed below were cancelled following the revolution. From the USA an incredible order for more than $15 billion in fighter jets were placed, for 300 F-16 Fighting Falcons, 16 McDonnell Douglas F-4 Phantom II RF-4E reconnaissance planes and a further 71 Grumman F-14 Tomcats on top of the 79 that had arrived. All of these orders were due in 1980. Other orders included 250 McDonnell Douglas F/A-18 Hornet, 90 F-15 Eagles, 70 Fairchild A-10 attack bombers all of which were due by 1985. A further 500 M109 howitzer's, 400 M60 Patton A3 tanks were ordered in a deal worth under 1 billion. 3000 trucks and 6000 Jeeps were being manufactured in Iran with the help of the USA were on their way to the front as well as a booming technological industry. The last known orders were for several planes full of light weapons and ammunition's. The Iranians placed a $7 billion in ordering 2000 Challenger tanks from the British along with a further 300 Chieftain tanks and 250 FV101 Scorpion light tanks. [contradiction] A $3 billion order was placed for 3 Invincible class aircraft carrier able to carry 18 jets and 4 helicopters and the aircraft carrier's to be equipped with Sea Sparrow missiles and Goalkeeper CIWS. Included in this order were 6 Type 42 destroyer's equipped with Harpoon missiles, a Sea Dart missile system and Sea Wolf missiles. Along with this order were several minesweepers, patrol boats and further SR.N6 military hovercrafts. Iran also had contracted them for training, construction of bases and further development of Iranian made military products. After the USA, Britain was Iran's largest arms supplier. This trend would continue with many other countries in the Middle East such as Saudi Arabia and the United Arab Emirates. From the Dutch Iran, ordered 8 Kortenaer class frigate's equipped with Harpoon missiles, Sea Sparrow missiles, and Mark 46 torpedoes. Iran had ordered from the Germans 6 Type 206 submarine's and 6 Type 209 submarine's submarines to be equipped with sub Harpoon missiles and from the French 12 La Combattante IIa class fast attack craft's equipped with Exocet missiles, of which 2 arrived. From Japan 4 mine layers were ordered but only was delivered the Iran Ajr, which was subsequently captured by the USA in the Iran-Iraq war. Most of the orders placed from Russia were lighter weaponry such as arms and trucks. They had placed an order for 6 anti submarine Grisha class corvette's, 400 ASU-85 anti tank guns, 400 BMP-1 light tank and storage facilities and a further 200 ZSU-23-4 artillery vehicles. When the Carter administration turned down Iran's request for nuclear capable missiles, they turned to the Israelis. They were working on the Project Flower ballistic missiles with Israel, and had already begun purchasing 1 billion worth of Iraeli light arms as well as expressing interest in an upgraded Mirage V, the IAI Kfir and the Gabriel (missile). Other orders included radars, and electromagnetic warfare technology. Should the orders have been completed Iran would have been the undisputed great-power in the region and would have had the world's third most powerful military. At the same time Iran began construction on a few military bases including the Chah Bahar military complex. At this time Iran was purchasing over $20bn in nuclear stations, 8 locations would be built by the Americans, 6 by the Germans and 2 by the French, for its 36,000 MW nuclear project which could produce enough uranium each year for 700-800 warheads. By 1985 Iran had planned to stop ordering military equipment and would have been able to field one of the most powerful armies in the world. Before the Iranian revolution of 1979, Iran contributed to United Nations peacekeeping operations. Iran joined ONUC in the Congo in the 1960s, and ten years later, Iranian troops joined UNDOF on the Golan Heights. In 1979, the year of the Shah's departure and the revolution, the Iranian military experienced a 60% desertion from its ranks. Following the ideological principles of the Islamic revolution in Iran, the new revolutionary government sought to strengthen its domestic situation by conducting a purge of senior military personnel closely associated with the Pahlavi Dynasty. It is still unclear how many were dismissed or executed. The purge encouraged the dictator of Iraq, Saddam Hussein to view Iran as disorganised and weak, leading to the Iran–Iraq War. The indecisive eight year war wreaked havoc on the region and the Iranian military, only coming to an end in 1988 after it expanded into the Persian Gulf and led to clashes between the United States Navy and Iranian military forces between 1987-1988. Following the Iran–Iraq War an ambitious military rebuilding program was set into motion with the intention to create a fully fledged military industry. ↑ ʻAbd al-Ḥusayn Zarrīnʹkūb (1379 (2000)). Dū qarn-i sukūt : sarguz̲asht-i ḥavādis̲ va awz̤āʻ-i tārīkhī dar dū qarn-i avval-i Islām (Two Centuries of Silence). Tihrān: Sukhan. OCLC 46632917. ISBN 964-5983-33-6. ↑ Hatch Dupree, Nancy. "Sites in Perspective". An Historical Guide To Afghanistan. ↑ Daniel, Elton L.. The History of Iran. p. 74. ↑ Busse, Heribert (1975), "Iran Under the Buyids", in Frye, R. N., The Cambridge History of Iran, Volume 4: From the Arab Invasion to the Saljuqs., Cambridge, UK: Cambridge University Press, page 270: "Aleppo remained a buffer between the Buyid empire and Byzantium". ↑ Islamic Central Asia: an anthology of historical sources, Ed. Scott Cameron Levi and Ron Sela, (Indiana University Press, 2010), 83; "The Ghaznavids were a dynasty of Turkic slave-soldiers..."
↑ Black, Jeremy (2005). The Atlas of World History. American Edition, New York: Covent Garden Books. pp. 65, 228. ISBN 978-0-7566-1861-2. This map varies from other maps which are slightly different in scope, especially along the Mediterranean and the Black Sea. ↑ Grousset, Rene, The Empire of the Steppes, (New Brunswick:Rutgers University Press, 1988), 147. ↑ John Perry, "The Historical Role of Turkish in Relation to Persian of Iran", Iran & the Caucasus, Vol. 5, (2001), pp. 193-200. ↑ Hodges, Peter (1971). Battle Class Destroyers. London: Almark Publishing. ISBN 0-85524-012-1. ↑ "Iran's gulf of misunderstanding with US". BBC News. 2006-09-25. http://news.bbc.co.uk/1/hi/world/middle_east/5377914.stm. Retrieved 2010-05-12. Moshtagh Khorasani, Manouchehr (2006). Arms and Armor from Iran: The Bronze Age to the End of the Qajar Period. Legat Verlag. ISBN 978-3-932942-22-8. The Middle East: 2000 Years of History From The Rise of Christianity to the Present Day, Bernard Lewis, London: Weidenfeld & Nicolson, 1995. Qajar Studies: War and Peace in the Qajar Era, Journal of the Qajar Studies Association, London: 2005. Moshtagh Khorasani, Manouchehr (March 2009). "Las Técnicas de la Esgrima Persa" (in Spanish). pp. 20–49. http://www.revistadeartesmarciales.com/. Moshtagh Khorasani, Manouchehr (2009). "Persian Firearms Part One: The Matchlocks". pp. 42–47. http://www.classicarmsandmilitaria.com/. Moshtagh Khorasani, Manouchehr (2009). "Persian Firearms Part Two: The Flintlock". pp. 22–26. http://www.classicarmsandmilitaria.com/.